Not since the blitz during World War II have so many fires raged in London so intensely at one time. It started with a riot in the working-class, multiracial borough of Tottenham in North London on Saturday, Aug. 6, sparked by peaceful protests against the police shooting of a man from a notorious local estate. By the early hours of Tuesday, Aug. 9, Britain's capital was in chaos as gangs of rioters rampaged through high streets across the city, torching businesses and homes, looting stores and attacking lines of police who were struggling  and largely failing  to stop the violence from spreading. Liverpool, Manchester and Birmingham weren't far behind; within three days, the London crisis was a national one. In a statement released on Tuesday morning, London's Metropolitan Police Service described the violence on the evening of Aug. 8 as the worst in living memory. Six thousand police took to the streets. They made more than 200 arrests overnight, bringing the total to more than 450 since the rioting kicked off. Forty-four police sustained injuries on Monday night; one officer broke several bones after a car drove into him. Fourteen members of the public are also known to have been hurt, including a man in his 60s who sustained "life-threatening head injuries." Over the 24-hour period ending at 9 a.m., police had received about 21,000 emergency calls  400% more than normal. Those calls came from across the capital, as apparently spontaneous eruptions of violence and arson hit areas as far apart as Clapham in the south of the city, Ealing in the west and Hackney in the east. The only common factor seemed to be that each incident involved high streets attractive to gangs of looters. 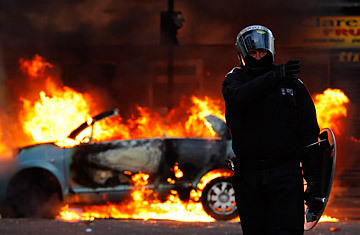 Any notion that the violence would remain a small, localized eruption of anger over an isolated incident, confined to an area with plenty of social problems, poverty and disengagement, was brutally dispelled as the rioters, communicating through BlackBerry messaging and Twitter accounts, moved from borough to borough, from inner-city Peckham to suburban Croydon. There, a 26-year-old man who was found alive in a car with a gunshot wound later died in a hospital. The first escalation started on Monday afternoon in Hackney, a poor, ethnically diverse borough with low homeownership, high welfare dependency and large housing estates  the classic profile for tension, according to previous experience. Hackney's main shopping street became a battleground between police and rioters who smashed into boarded-up shops to escape with whatever they could carry, with clothes and sneakers being a particular target. Near the Pembury Estate housing project, four youths beat a photographer whom they accused of being with the "feds," while others threw bricks and stones at police. Accounts from witnesses suggested that a growing number of women were participating in the violence. But even as politicians and community leaders debated whether the riots were the latest, inevitable result of social exclusion and government spending cuts, news broke later that evening of an eruption in Ealing, a relatively affluent, leafy middle-class area in the west of the city. Then it was Croydon, many miles south of Hackney and not a neighborhood usually seen as a tinderbox. Reports of violence followed from across London  Camden Town, Waltham Abbey, Brixton, Notting Hill  as borough after borough, with little to link them, fell victim to the chaos and arson. Throughout the evening, local residents voiced concerns over what they perceived as a lackluster response from police. "My neighbor's house is on fire. It's absolutely bedlam on the streets," a frantic onlooker told news crews near a fire in Clapham, a neighborhood increasingly popular with young families. "People have been openly looting this area for the one or two hours since I got here, and the police have been ineffectual. They've done nothing." In the absence of a more robust police response, one video shows looters calmly sizing up various stores and deciding what they'd like to steal. In Croydon, a fire at a furniture store grew larger and larger as the nation watched on television. Fire crews were delayed because the police could not guarantee their safety. Theresa May, the Home Secretary, flew back from her summer holiday in Switzerland on Monday to deal with the crisis. She ruled out both sending the army onto the streets and deploying water cannons to disperse the crowds, a move advocated by London's former mayor Ken Livingstone. Authorities have used the high-pressure spray to control mobs in Northern Ireland, but they have never utilized them on the mainland. "The way we police in Britain is not through use of water cannon," May told Sky News. "The way we police in Britain is through consent of communities." Fresh in her mind, no doubt, is the lingering criticism of the police force's response to the G-20 protests in 2009. Britain's high court ruled in April that Met police broke the law when they surrounded and cordoned off large crowds of protesters  including nonviolent ones  for extended periods of time (a police tactic known as "kettling"). A police officer will face trial in October after Ian Tomlinson, a protestor he allegedly pushed to the ground, collapsed and died shortly afterward. As the violence spreads beyond London and police resources grow even more strained, May will face mounting pressure to call out the cannons. Fellow politicians have already spoken in favor of harsher tactics. "I find it strange that we are willing to use these sort of measures against the Irish, yet when Englishmen step out of line and behave in this atrocious and appalling way, we are happy to mollycoddle them," Patrick Mercer, a Conservative MP and former army officer, told the Daily Telegraph. "If the police want cannons, then they should be allowed to use them. I have used water cannons myself, and I found them extremely effective." Even without the cannons, though, the police response appears to be toughening. In Clapham, forces deployed armored vehicles known as Jankels in the early hours of Tuesday morning to drive off a crowd of 150 looters who had broken into local shops. Senior London officers have subsequently announced that they will fire plastic bullets at looters if necessary. And during his first televised comments on the matter, Prime Minister David Cameron vowed that 16,000 police officers  an increase of 10,000 over last night  will be on duty Tuesday evening. He had a clear message for the arsonists, looters and vandals attacking their own country. "You will feel the force of the law," he said. "If you are old enough to commit these crimes, you are old enough to face the punishment." See more on Britain's student riots. See "Riots and Royals: Protests and Britain's Self-Image."